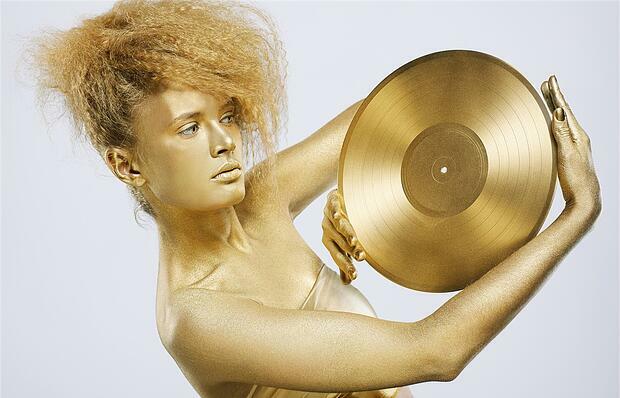 Streaming Finally Counts Towards Gold Certifications for Albums – What Does That Mean for You? Recently, the RIAA (Recording Industry Association of America) changed the methodology by which albums are certified gold and platinum. It used to be based solely on sales, but now streaming music will be included. Is this a good thing or a bad thing? Well, if you’re a veteran of the industry and a purist, you’d probably say it’s a bad thing, but for most artists trying to make a go of it these days, it’s not just reality, it can be seen as a leveling of the playing field. Here’s how it works: 150 plays of a song on any of the approved services will count as a paid download, and 10 of those will be the same as if a person had purchased an album. So, if you want the RIAA to register that someone bought your new album, have your friends, family, or a fan play one of the songs from it at least 1,500 times on a streaming platform. Or, you know, ask them to actually buy it. Things may be changing, but an album bought is an album bought. 1,500 streams might not earn you a whole lot of money, but then again, working with a major label and selling a CD wouldn’t either. Making money has shifted to other areas of the business, but if you do this whole streaming thing right and luck goes your way, you might be able to get yourself a gold record. The RIAA is taking its numbers from a wide range of stores and streaming platforms, which is beneficial for everybody. If you release a great single and pair it with a viral video, you’ll already be promoting it heavily, but now there could be another upside. The organization accepts all the official plays your track and its visual treatment receive on YouTube and Vevo, as well as Spotify, Deezer, and so on, and that’s not to mention all of the online stores that are also approved. Keep in mind that this new structuring is for albums, so if you have a single or a clip for a single that becomes popular, those streams count towards the album’s overall total. A million views here, a million views there...they all add up, and before you know it, you’re well on your way to finding your way into the history books. Add on the sales your work will receive, and reaching half a million “downloads” might not be as impossible as it once seemed. The list of services that are included in this new methodology is long, and while you might not be familiar with some of them, it’s good to have your music on all of them. Why wouldn’t you put your work on as many platforms and in as many stores as possible? It’s pretty easy to have that done these days, as there are many services which blanket all of the possible services and music sellers with new music, and it involves very little work from you. Now, I’m not saying that because streaming has become a factor in determining which records get certified, you’ll all of a sudden be handed a plaque in no time, but it does make it within reach for some acts. Selling half a million or a million copies of anything these days is rare, so unless you’re Taylor Swift, this might be your only way of possibly getting some of the same recognition. You’ll still have to work hard, and chances are you won’t get to that glorious benchmark, but trying won’t hurt you, and in fact you’ll be better off for it. And who knows, maybe your next video will be the one that the internet goes crazy over for a week or so, and it’ll rack up enough views to help nudge you past the 500,000 mark.